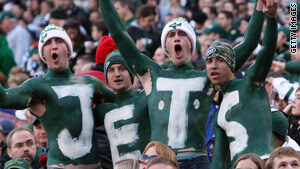 New York Jets fans, known for their rowdiness, won't be able to drink in stands Sunday when team plays Cincinnati. New York (CNN) -- When the New York Jets face the Cincinnati Bengals Sunday for what may be the final football game played at Giants Stadium, fans in attendance won't be able to drown their sorrows or toast a victory. The Jets have banned the sale of alcohol on Sunday at the stadium they've called home for 26 years. "With the late start of Sunday's game, coupled with this being the final regular season and final game at the stadium, we feel it is prudent not to serve alcohol," said Bruce Speight, a spokesman for the team. The Jets approach the decision of whether to serve alcohol on a game-by-game basis, Speight said. Fresh off a victory over the formerly undefeated Indianapolis Colts, the Jets are on the verge of their first play-off berth in three years -- and fans are riled up and ready to go. And Jets fans are known for rowdy behavior -- for example, a half-time "tradition" of women baring their breasts for men who loudly urge them to do so. In lieu of alcohol, the Jets said, they'll pass out green and white "rowdy towels" to the first 70,000 fans arriving at the stadium. But the ban has raised the ire of a New Jersey vodka distillery. Majorska Vodka, which calls itself "one of the largest liquor companies in the Garden State," is calling for a 24-hour boycott of Johnson & Johnson products because, according to company spokesman Jeff Scott, Jets owner Woody Johnson is the "heir to the Johnson & Johnson fortune." Scott said Majorska plans to stop paying for three of their executive's seats at the Meadowlands and that the company is set to lose more than $100,000 in revenue from tailgate parties this weekend. The New York Jets officially declined to comment, but team spokesman Speight said that "negative fan reaction has been minimal at best" and pointed out that vodka is not sold anywhere in the stadium and the ban does not apply to tailgating. But Martin Silver, Majorska's president and CEO, said fans are shocked and outraged that the Jets are treating their supporters "like children." Silver, a life-long Jets backer with a Joe Namath jersey hanging in his office, is directing his frustration at the team's ownership because he feels they are "controlling the game completely." He said his company is distributing anti-Johnson & Johnson petitions Friday to 350 sports bars across New Jersey. "We're taking this on, right to the top, to Johnson," said Silver. Woody Johnson is the grandson of Johnson & Johnson founder Robert Wood Johnson, but is not currently connected to the company. William C. Weldon is the company's chairman and CEO. None of the Johnson family serves on the company's management team or board of directors. Johnson & Johnson spokesman Bill Price said that "officially we have no comment given that the Johnson family has had no managerial role with the company for decades." Giants Stadium, part of the Meadowlands Sports complex in East Rutherford, New Jersey, has been home to both the Jets and the New York Giants, who played their first game there on October 10, 1976. Early on during their tenancy at Giants Stadium, the Jets refered to the 82,000-seat arena simply as "the Meadowlands" although in recent years Jets tickets have used the facility's official name. The stadium, which has hosted popes, concerts and major league soccer as well as football, is to be demolished after this season. Both New York teams will move into a new stadium just a short distance away next season. That stadium will get its name from a corporate sponsor, yet to be named.